Fortunately there is some software that can sort this problem out for us. Today I tried Avidemux and I got surprised with the easiness of the process and the quality of the result obtained. Avidemux is a nice open-source program designed for video editing. It's platform independent so that it runs under Windows, Mac OS X, Linux and BSD. 6) it's time to save the file. Give it a name and let Avidemux do the job for you. Done? is rotating a video by avidemux lossless? I just tried to rotate an iPhone .mov file 90 degrees. AviDemux took all my settings, but it did no rotation. What am I missing? I followed these steps, and as per the person above it does not work. I then realized that the filters were not being applied when video was set to copy. 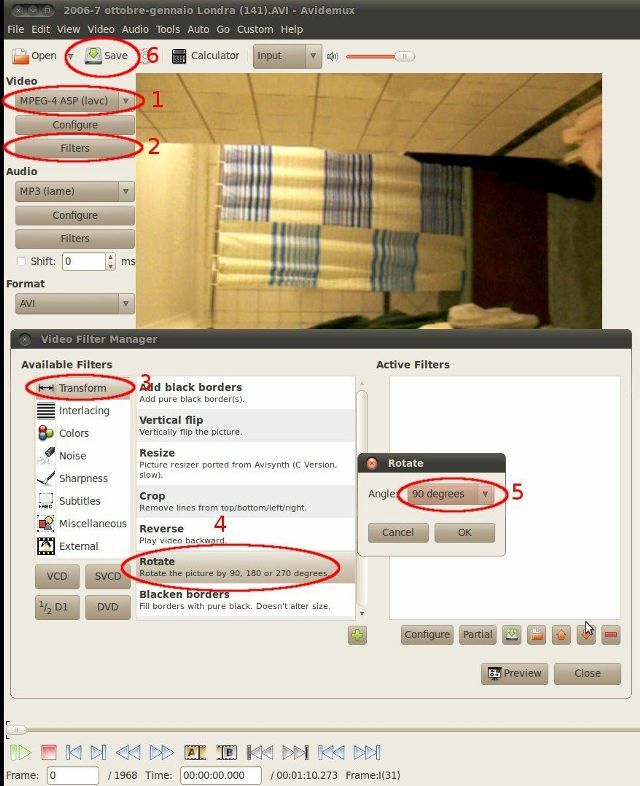 As per the first photo, you must select a video output, e.g. MPEG-4. When you do this it processes the applied filter. It is amazing how quickly this tool can work with very large files. Windows Live Movie Maker takes 5 minutes to process the large files and then crashes when you ask to save. Having gone back and read the post more, it does actually say you can’t just leave it as copy. Clarifying my result. good tip, thanks for sharing. Is it possible in Avidemux (or any other free programme) to rotate a video a few degrees (say, 5), or are 90, 180, and 270 degrees the only amounts possible? I’m not sure about other programs but Avidemux seems to do only 90, 180 and 270 (I just checked it on version 2.5.4). Works without quality loss, perfect. It works just fine. TY. I did exactly as described, but it won’t work :( i cannot save it. Is there no easier way to just rotate a video ? I tried this with Avidemux 2.5.2. Are you using the same version? Doesn’t work. 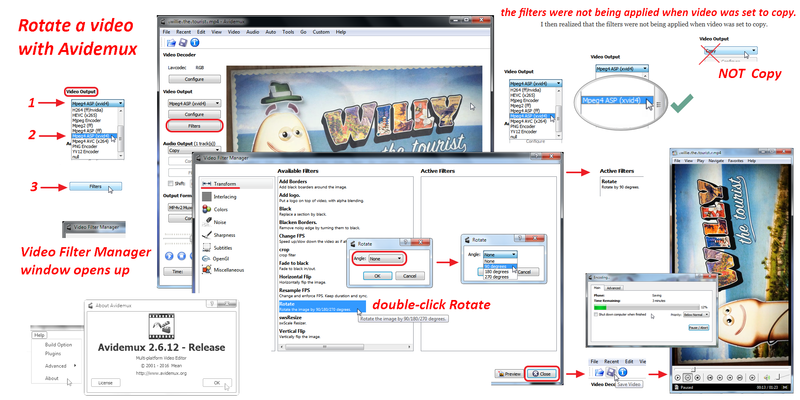 Setting the filter is easy, but the File -> Save operation does not actually *apply* the rotate filter. Just worked fine with the Windows Version (2.7.0) and a MOV file. I am impressed. A .MOV file taken from iPhone 6 was upside down. AVIDemux on Windows 7 (64-bit) rotated it by 180 degrees in seconds without any problem. I is a great tool! Tried this on 2.6.14 and worked like a charm. You made it really easy to follow. Thanks!